Apple Slowed Down Your iPhone & Got Caught: The Fake Reason Why. You are at:Home»iPhone»Apple Slowed Down Your iPhone & Got Caught. Their Fake Reason Why. Apple Slowed Down Your iPhone & Got Caught. Their Fake Reason Why. Did you hear about the favor Apple did for us? According to their recent statement, Apple didn’t want people “…to lose a call, miss taking a picture, or have any part of their iPhone experience interrupted,” so they released a software fix to prevent “unexpected shutdowns” in older iPhones. Thanks for watching out for us, Apple! All of that sounds great, but there’s one problem: It doesn’t make any sense. I believe that what we’re really seeing here is a brilliant example of corporate sleight of hand and a correlation vs. causation fallacy. Apple got caught reducing the speed of older iPhones, and people were angry. So they made up a story. In Wikipedia’s article called Correlation does not imply causation says a logical fallacy can occur “…when two events occurring together are taken to have established a cause-and-effect relationship.” Their statement is an example of a correlation vs. causation fallacy. Apple says that chemically-aged batteries cause unexpected shutdowns, but this is untrue unless a battery is damaged or very, very old — much older than the iPhones Apple got caught slowing down. With a great amount of time, all batteries will eventually stop working, but Apple is saying this happens much, much sooner than it does. They’re using the correlation vs. causation fallacy to explain why they slowed down older iPhones, even though those iPhone batteries were perfectly capable of delivering a sufficient charge to operate the iPhone at peak performance. One way to visualize the problem is like this: Imagine that a car manufacturer slowed down the engines of every car (except for this year’s model) because a few, very old cars with damaged gas tanks were stalling. You wouldn’t be happy because there was nothing wrong with your car. They didn’t fix a problem because nothing was broken. They slowed down your engine, got caught, and said it was to prevent a (non-existant) serious problem. Why? Because they care. This is a response to Apple’s message. I’ll try to cut through some of the stench and provide you, the reader, with additional information that you can use to draw your own conclusions. I’ll begin by responding to their statement, with my comments in bold. Bear this in mind as you read: Except in rare circumstances, an iPhone battery has nothing to do with how fast it performs. Try to stay focused on what Apple was caught doing (decreasing the speed of older iPhones), and on how this message is designed to divert your attention away from that and onto the battery. We’ve been hearing feedback from our customers (we got caught) about the way we handle performance (performance = speed) for iPhones with older batteries (iPhones with older batteries = older iPhones) and how we have communicated that process (we didn’t tell you). We know that some of you feel Apple has let you down (and are going to file a lawsuit). We apologize. There’s been a lot of misunderstanding about this issue, so we would like to clarify (in a vague way) and let you know about some changes we’re making. First and foremost, we have never — and would never — do anything to intentionally shorten the life of any Apple product (nobody is accusing Apple of shortening the life of the product — they were caught slowing it down), or degrade the user experience to drive customer upgrades (we wouldn’t degrade the user experience for that reason). Our goal has always been to create products that our customers love, and making iPhones last as long as possible (by slowing them down?) is an important part of that. You are now supposed to think, “Apple did what they did to make my iPhone last as long as possible.” We all want our iPhones to last a long time, but slowing down the processor is A) going to have a negative impact on how our iPhones actually work (and how much I love it), and B) not going to have any impact on how long they last. All rechargeable batteries are consumable components that become less effective as they chemically age and their ability to hold a charge diminishes. True: The capacity of a lithium battery does decrease over time. But why are we talking about batteries? Time and the number of times a battery has been charged are not the only factors in this chemical aging process. Device use also affects the performance of a battery over its lifespan. For example, leaving or charging a battery in a hot environment can cause a battery to age faster. You’re supposed to realize that your battery has aged “faster” because you’ve been in hot environments at times. Unless you’re an eskimo, you can probably relate to this. Yes, your iPhone 6 is a few years old and it doesn’t have quite the capacity it did when it was new, but when did we stop talking about how Apple slowed down your iPhone? These are characteristics of battery chemistry, common to lithium-ion batteries across the industry. The part about the hot environment is true, and very hot environments can damage the iPhone battery — but your iPhone battery probably isn’t damaged. And it takes a long time for an iPhone battery to get to the point where reducing the speed of the iPhone would ever be necessary. And again: The battery has nothing to do with the speed of the iPhone. A chemically aged battery also becomes less capable (how much less capable?) of delivering peak energy loads, especially in a low state of charge (how low? 20%? 10%? 2%? ), which may result in a device unexpectedly shutting itself down in some situations (which situations?). Fact: What we’re talking about here are damaged or extremely old batteries. Your iPhone battery is probably a lot healthier than they’d like you to believe. It should go without saying that we think sudden, unexpected shutdowns are unacceptable. We think so too, but that wasn’t happening. We’re supposed to talking about how you slowed down our iPhones, Apple! We don’t want any of our users to lose a call, miss taking a picture, or have any other part of their iPhone experience interrupted if we can avoid it. Timeout! Let’s take a closer look at the previous paragraph. It is masterful manipulation. Apple imples that if they didn’t do what they did (slow down your iPhone), you would have “lost” calls or missed taking pictures. These are both experiences that you connect with emotionally. But the problem is made up. Except in rare circumstances where the battery is damaged, your older iPhone was never going to “lose” a call and you would never have had a problem taking pictures of your family. Apple invented the “sudden, unexpected shutdowns” problem and used examples that play on your emotions, so they could convince you what they did was necessary. Do not be mistaken: their marketers are that smart. About a year ago in iOS 10.2.1, we delivered a software update that improves power management (decreasing processor speed) during peak workloads (peak workloads = when you use your iPhone and need the processor to be fast) to avoid unexpected shutdowns on (nonexistent problem, happening only in very rare circumstances where the battery is damaged) iPhone 6, iPhone 6 Plus, iPhone 6s, iPhone 6s Plus, and iPhone SE. I was an Apple tech. This is rare. With the update, iOS dynamically manages (reduces) the maximum performance of some system components (the processor, but we’re not going to say the P word) when needed to prevent a shutdown (and every other time). While these changes may go unnoticed (and we hoped they would), in some cases users may experience longer launch times for apps and other reductions in performance (everything would be really slow). Customer response to iOS 10.2.1 was positive (it included a lot of new features), as it successfully reduced the occurrence of unexpected shutdowns (which were not happening to you). And software updates always fix bugs. Unexpected shutdowns happen for a variety of reasons — not just due to a damaged battery. We recently extended the same support (and by “support”, we mean we made your phone slower) for iPhone 7 and iPhone 7 Plus in iOS 11.2 (whose iPhones are not that old and certainly don’t need any special treatment). Of course, when a chemically aged battery is replaced with a new one, iPhone performance (battery performance?) returns to normal when operated in standard conditions. Wait. We didn’t have an issue with the battery performance — we had an issue with the processor performance. Important trick: This entire statement uses the word “performance” in two very different ways. You’re supposed to think “speed” when they say performance, but that’s only true with the processor (a word that is never used in this statement). When we’re talking about the battery, performance has to do with its capacity and has nothing to do with the speed your iPhone. Only damaged batteries would not be able to put out sufficient amount of charge to power the processor. 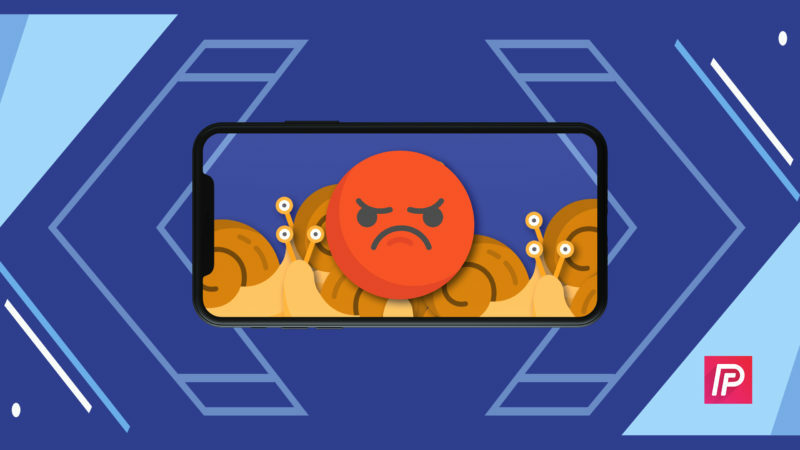 Over the course of this fall, we began to receive feedback from some (pretty mean) users who were seeing slower performance in certain situations (like when they were using their iPhone). Based on our experience (before we started intentionally slowing down the processor along with software updates), we initially thought this was due to a combination of two factors (we didn’t even consider that it could have been because we reduced processor performance, because we didn’t want to tell anyone we had): a normal, temporary performance impact when upgrading the operating system as iPhone installs new software and updates apps, and minor bugs in the initial release which have since been fixed. You’re supposed to believe that Apple didn’t know what was happening. They had no idea that slowing down the processor on iPhones would lead to “slower performance in certain situations.” I mean, you’d have to be a Genius to figure that out. We now believe that another contributor to these user experiences is the continued chemical aging of the batteries in older iPhone 6 and iPhone 6s devices, many of which are still running on their original batteries. But what does this have to do with the speed of the iPhone? Yes, our batteries have aged, but they can still do the job, except when they’ve been damaged. Maybe can’t they hold as much gas in the tank as they used to, but the engine is still the same. And Apple, you got caught throttling back the engine — not doing anything to the battery. The battery is a smokescreen. We’ve always wanted our customers to be able to use their iPhones as long as possible (but at what cost?). We’re proud that Apple products are known for their durability (but still, don’t drop your phone in the toilet), and for holding their value longer than our competitors’ devices, which has nothing to do with the performance issues. Apple is reducing the price of an out-of-warranty iPhone battery replacement by $50 — from $79 to $29 — for anyone with an iPhone 6 or later whose battery needs to be replaced, available worldwide through December 2018. Details will be provided soon on apple.com. Wait. Apple intentionally slowed down people’s iPhones and is now charging a reduced cost to fix the battery, which is supposed to increase speed? Early in 2018, we will issue an iOS software update with new features that give users more visibility (we’ll show you what we want to show you) into the health of their iPhone’s battery, so they can see for themselves (you make the call, we’ll provide the data) if its condition is affecting performance. But you have no way of knowing what we’ve actually done up until now. As always, our team is working on ways to make the user experience even better, including improving how we manage performance (if we intentionally slow down your iPhone, we’ll do it in a way where we don’t get caught) and avoid unexpected shutdowns (our made-up problem) as batteries age. At Apple, our customers’ trust means everything to us. We will never stop working to earn and maintain it. We are able to do the work we love only because of your faith and support (and your not suing us) — and we will never forget that or take it for granted, especially when we get caught. In this statement, Apple implies that chemically aged batteries are incapable of powering the iPhone processor at peak performance, but that is rarely the case. So how do they measure whether the battery is capable of performing at peak efficiency? By its “chemical age”. In Apple’s other statement, they take facts like “As lithium-ion batteries chemically age, their ability to hold a charge diminishes…” and mix those facts with a lot of “may” and “can” statements, like “A battery’s impedance can increase if a battery has a higher chemical age,” and “…a battery’s ability to provide power quickly may decrease.” There are no facts or percentages here. Yes, a battery’s impedance will increase with age, but to what degree? Is it enough to cause these “unexpected shutdowns?” Absolutely not. I don’t have the exact numbers, but based on my experience working with hundreds of iPhones at the Apple Store before any of these features were introduced, I can say that the problem is very rare. Let me say this: It does makes sense to throttle back processors if a battery is aged to the point where it can no longer deliver a sufficient charge and unexpected shutdowns are occurring. Apple is implying that they are measuring this, but they aren’t. They’re going by the chemical age of the battery. Device temperature: Colder temperatures do increase impedance.iPhones turn off when they get cold because the battery can no longer deliver a sufficient charge, and turn back on when they warm up. I’m all for this one, and this has happened since the dawn of iPhones. Battery state of charge: iPhones do shut off once they go past 1% on the screen, but there is some charge left. If there were nothing, the “connect to power” graphic wouldn’t be displayed. This has happened since the dawn of iPhones. Battery impedance: This is the new one. Apple is unclear about exactly how they are measuring this, but they do give a hint earlier in the statement: Apple says impedance is measured by “…the number of charge cycles and how it was cared for.” Charge cycles are the number of times your battery was discharged from 100% to 0%. Although a battery with a high number of charge cycles certainly will have less capacity and does have a higher chance of this inability to deliver an adequate charge, that chance is very, very small — especially after just a few years. Apple does a wonderful job with their battery technology, and battery technology has come a long, long way. They’re saying they fixed a problem that they themselves have already fixed. I do not believe Apple has an accurate way to measure whether a battery is healthy enough to deliver a sufficient charge to maintain peak performance before an “unexpected shutdown” has occured. Think about it: How would they? Why should they go by the chemical age of the battery when it, except in rare or extreme circumstances, does not cause the problem they are “fixing?” If performance is going to be significantly degraded, I believe we should fix problems only after they occur at least once. This is an example of obscuring their true motives by confusing correlation with causation. Do you have an old iPod or iPhone laying around? Does it turn on? Does it function properly? How about an 3-year-old laptop? Sure, the battery doesn’t last as long, but there are no “unexpected shutdowns” unless the battery is damaged or very, very old. Although we frequently discard old devices due to speed (bear in mind, we discard them because they are slow), their batteries are capable of keeping them on. The “unexpected shutdowns” occur very rarely, and Apple is using language to obscure that fact. It would be like saying that people who are 60 years old are no longer capable of doing complex math problems, so they all need to be slowed down to avoid “unexpected interruptions.” Although there are some, rare circumstances that cause 60 year olds to have decreased mental abilities, it doesn’t make sense to slow everyone down. If I were 60 and being sent to a home, I wouldn’t be happy. This analogy certainly isn’t perfect — for it to really make sense, the hospital would have to be selling them a new, younger brain; albeit at a discount. It’s my belief that Apple has used the battery issue as a smokescreen for their behavior. Apple knows that lots of iPhone users struggle with battery issues, and it is a fact that capacity performance decreases with time. But the capacity of a battery has nothing to do with the speed of the iPhone. The speed of an iPhone affects everything, and it’s one of the primary reasons people upgrade. If it takes ten seconds to load a webpage on my iPhone and the person next to me takes two, that’s a huge difference. Speed affect how the iPhone feels when you use it. It helps to visualize the problem like this: An iPhone’s processor is like the engine of your car, and its battery is like the gas tank. The processor determines how fast the iPhone can go, and the battery determines how far it can go (or how long the battery lasts). As lithium batteries age, their maximum capacity decreases. This is where the car analogy isn’t quite perfect, but imagine this: When you bought your car, it came with a 15 gallon tank. Now, 3 years later, your gas tank can only hold 10 gallons, but that doesn’t have anything to do with how fast the car can go — it has to do with how far your car can go. Apple says they have reduced processor speed to prevent “unexpected shutdowns” in iPhones with older batteries. If the gas tank of your car is damaged, your car may “unexpectedly shut down” because it can’t provide enough gas consistently to power the engine. If the gas tank has undergone normal wear and tear and just can’t hold is much, the engine will be just as fast — it just won’t go as far. It’s the same with iPhones. Except in instances where the battery is damaged or extremely old, a battery with reduced capacity will have no problem powering the processor — it just won’t be able to do it for as long. In other words, you won’t have the same battery life as you used to, but there’s no need to slow down the iPhone to do that. “Unexpected shutdowns” are a rare problem for batteries of any age. Apple is using “unexpected shutdowns” as an excuse. It’s no excuse. How Has This Gone Unnoticed For So Long? All throughout the history of computers, the speed of a computer has decreased when a new operating system is installed. It wasn’t because the processor had been intentionally slowed down. The new software contained new features, and the old processor couldn’t keep up. But Apple isn’t just building in new features — they’re reducing the speed of the processors at the same time they introduce new features, so nobody notices — they just think, “Oh, it’s slower because that’s what happens when you put new software onan old phone.” And that’s what’s new. Well, there you have it. It’s up to you to draw your own conclusions. Apple is vague about almost everything they do, and I may not have all the information. I’m not a conspiracy theorist. But what Apple has done is to “fix” a problem affecting only a handful of iPhone owners by compromising the performance of every iPhone owner — unless you have the newest model. And I have the iPhone X, so I’ll be operating at peak performance — at least until iOS 12 comes out. Previous ArticleMy iPhone X Won’t Unlock! Here’s The Real Fix. Next Article Why Is The iPhone X Camera Vertical? Here’s The Truth!